It’s been a couple of years now that I’ve been buying my vanilla beans in bulk. It’s so wonderful to have them on hand for any recipe that calls for vanilla, and to see those gorgeous flecks of vanilla bean speckled throughout whatever it is I’ve made. I take pride in making my own vanilla extract, such better quality than the stuff from the store, and so much more economical. $5 for a little bottle…say whaaaa? Don’t you just love these limited edition Ball Heritage Jars? Mason jars have always been my go-to for food storage in the kitchen – so useful and practical. But these gorgeous jars that Ball has come out with for their 100th anniversary are just simply lovely to look at! I’ve always loved the old jars with the blue tint, and enjoy seeking them out at yard sales and flea markets. But to have some that are actually usable? So cool! The good folks at Ball have offered to give a case (set of 6 pint jars with lids) away to a lucky reader. To enter, just leave a comment telling us what’s your favorite use for a Ball jar? In the kitchen, or anywhere. Contest runs today through June 26th at 11:59 PM EST. Place sugar in airtight container, place beans the the container with the sugar. Cover with lid and give a few shakes to cover beans with sugar on all sides. Let sit for 1 week before using. Keep replenishing with used vanilla bean pods and additional sugar as needed. Disclaimer: I received a case of Ball Heritage pint jars to review at no cost. As always, all opinions are my own. I use Ball jars for EVERYTHING. I drink just about exclusively out of Ball mason jars, they store things in my refrigerator and pantry, I use them as flower vases and to store hair ties in the bathroom… literally everything! The blue ones are just beautiful! Love to buy things in bulk (example: oats or flour) and I store the bulk items in jars for our pantry. Plus I do enjoy canning…love to make strawberry/blueberry jam…need jars for those! This is not a food use , but i have a Jar of keepsakes from when my now grown son was a boy , It includes a butterfly he found , and other treasures that would not have kept , if not in a mason jar . It is like having a time capsule of his childhood on my cupboard , and it warms my heart and makes me smile every time I walk past and see it . My favorite way to use Ball jars. The large ones can’t be beat for fresh fruit, herbs or spice infusions of rum, tequila or vodka. The smaller ones? To drink the resultant cocktails from, of course! Ball jars just make them even better! I use my ball jar for a keepsake..went to the beach for my 50th Birthday and collected sand..shells and rocks to put in the jar.now I have a great reminder of fhat special day! I’m trying to use glass instead of plastic so I’m increasingly using them for everything, right now I’m staying where I don’t have any & what I miss them most for is leftovers. I use Ball jars as storage for baking ingredients — various flours and sugars. I remove the labels from the original packaging and cut it to fit under the ring, so I always know the contents of each jar. My fav use is for illumination! Jar + sand + votive = beautiful tabletop decoration! I love using Ball jars for making jam and preserves, applesauce, and have even baked pumpkin spice breads inside of them for gifts during the holiday seasons! I love all the sizes of the jars, and even have some antique ones, too! I use ball jars for…. layered salads in the fridge! My vintage blue Ball jars are just right for Mojitos on the deck…will also put up blueberry jam later this year. I use Ball jars for lots of gifts at Christmas time, but my favorite use for them is storing homemade creme fraiche. Those are so pretty. I sue my jars for storage. Chocolate chips, coconut shavings, etc. They are great for salad on the go too. i use jars for all sorts of things. i store beans, rice, etc. in the 1/2 gal. ball jars. love love love those! i use quarts for smaller storage. i use pints, 1/2 pints, 1/4 pints for all things canning. i even recycle the jars that are no longer able to be used for canning . i think ball is doing a great thing giving us the blue jars, and i would love to get them. not available here in grays harbor yet. I use Ball jars to can all summer long! I love my Ball jars for everything! I have just recently started using them all over the house for various things! Still love them for Jam though! Embarrassingly, I don’t own any (yet), but I’d love to serve up some root beer floats in them! I’ve been using Ball jars as storage for my almonds, pecans, etc. in my pantry. So much easier to get at them than the original bags they came in, and it looks so much nicer too! This vanilla sugar sounds delicious! My favorite thing to use a ball jar for is to drink out of, with a straw! Love it! I have been searching high and low for these blue jars ever since you put them on instagram!! Beautiful! I store Homemade bath salts and craft supplies. I use them for jam. I’d keep baking ingredients in there, such as chocolate chips. I use Ball jars for all kinds of things – to store my homemade caramel sauce, vanilla sugar and jams. I also love using them as memory jars for my baby boy – we have one from his first trip to the park, and will make one this weekend for his first trip to the beach. Hello! Is the contest open to residents outside the States? Let me double check with the sponsor, but I’m thinking it probably is US Residents only. Will let you know, thanks! My favorite use is for drinking out of but gosh they’re great for almost anything! I use them for all sorts of things, to store baking ingredients, sewing equipment, vases, jams, curd, make up brushes, and many other things ???? I can tomatoes and jam every year. I also have a very old jar filled with pestosky stones from a vacation with my hubby. I like to use them to make salads to go. Or to take an iced coffee to work with me! I lobe the blue tint on these! I use the ball jars for everything-food storage, as drinking glasses but my favorite is to display flowers! I use them to store everything, but really love them for making homemade vanilla extract. I like to use them to make my lunch salads for the week, just layer everything in and it stays super fresh and is easy to grab on the run! Love Ball jars! I take them to the grocery store & fill them with bulk items for my pantry – just make sure you ask them to tare it for you. Saves a plastic bag & it’s so much easier to find things in the cabinet! I love to bring them with breakfast or lunch fixings to work–portable, won’t spill, and can be heated easily! I just love to use these to store homemade jams and to place them strategically arounds the house filled with fresh faced daisies. What can’t you use them for? Each season is different from storing fresh cut herbs and flowers. My simple syrup for my new summer fav blackberry puree captain and ginger. At Christmas they are perfect for homemade body scrubs. Holding silverware at parties wrapped in pretty ribbons. My favorite use of mason jars are for flowers! I love the blue colors of the jars! I use mason jars for many things, but currently my favorite use is making overnight oats in the fridge. I put a small scoop of steel cut oats, cover it with almond milk, and then add whatever flavors I want… cocoa powder, nut butter, sliced bananas, strawberry jam… then in the morning I nuke it in the microwave, and eat it with a spoon on my way to work. So simple! I use the jars for flowers, actually. I’m sure I’m not alone. (I also use them for pickles but flowers are my favorite)….Thanks for the chance to win! I keep leftover hummus and stuff like that in them. I love using Ball mason jars for so many things. One of my most common things is for storing the “spice tea” mix that I mix up during winter-time. It looks pretty in the glass jar and is so easy to store. They are so good for leftovers in the fridge too. I have made the cakes in a jar too-what a fun treat. I have several ideas for layered deserts pinned on my pinterest board. I would love to have a new case and I would get busy making some of those deserts for friends or a party!! Love the recipe for vanilla sugar – thanks! Vanilla beans is on my shopping list today! I love canning tomatoes in the summer with Ball jars. I love seeing my students bring them in their lunchboxes to drink their mama’s tea out of! Of course I use then but lately we have started using them of all kinds of things, Short flowers yes, my raw sugar mixed with Stevia for my husbands coffee, in fact he used my last jar for some Moonshine a friend at work made him. lol I need to buy some more. I love blue glass as it is my very favorite so I will purchase some of these. These blue jars are so beautiful, they look like they would match the paint in my kitchen. I don’t own any, but if I did, I would certainly have many uses for them…serving beverages poolside, a vase for my hydrangeas and shasta daisies, utensil holders for outdoor picnics…the possibilities are endless!!! The blue jars would make lovely light fixture! I’m a canner and my favorite thing to can is string beans. I use Ball jars to hold my vanilla sugared pecans – and I give them to friends! My favorite uses for Ball jars are a BBQ Sundae with a Mason Dixon to drink!! Yum! These blue Mason jars are gorgeous! Mason jars remind me of many memories from childhood. My grandparents used them for canning, serving sweet tea, & storing leftovers in. One of my favorite uses for them brings back memories of my dad. He always made Coke or Root Beer floats in them. 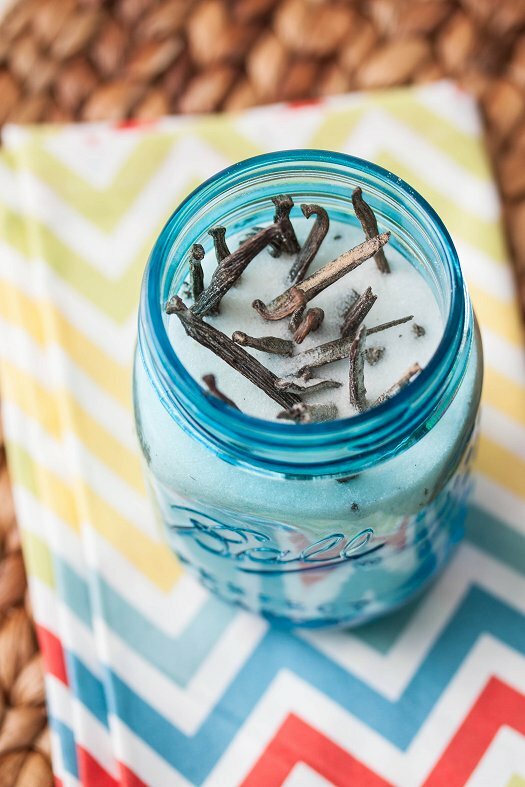 A scoop of vanilla, a pouring of your favorite pop, & a straw makes for a delightful Mason jar dessert/beverage. A modern use for these in the home, is to get an lED tea light in the bottom. I would use them outside by the pool, on the porch, or around my garden tub! I love to give my homemade gifts away in Ball jars – – everything from candles to layered bean soup mixes. I’ve even used itty bitty jelly jars as jewelry “boxes.” Their uses are limitless! I have one on my dining room table filled with dried hydrangeas, and one in my bedroom for my husband’s change.II’d love to have some of the blue Heritage Ball jars! As a vase — especially for wedding showers! I’ll be filling up mason jars with vanilla sugar, cake & cookie mixes and wrapping them with copper hangers to make flower & tealight holders for our clubhouse boutique. It is nice to use mason jars instead of plastic. I make vanilla extract in them & will decant it into 2 oz. bottles to sell at the boutique. I absolutely love mason jars. I’m so glad a lot of us do.